With so many backpack choices available, how do you know which one is the best use of your money? After all, a backpack becomes a part of your body while out on the trail so it needs to be comfortable. A good pack should also be durable and capable of carrying all of your gear securely and without pressure points that can quickly become painful after a few minutes on the trail. While there are many medium-sized pack choices available for the hiker that can meet the requirements set forth above, one pack stands out as a serious contender for the best hiking backpack money can buy – the Osprey Atmos 65 AG. How Many Pieces of Outdoor Equipment Can Claim That? Mesh webbing extending through the hipbelt and back panel to automatically contour to the body. This ensures an excellent fit regardless of whether the pack is empty or full. Side compression straps (upper and lower) to effectively reduce bulk while stabilizing the load for superior weight distribution and comfort. Quick access to essential items stored in the two zippered pockets found in the removable floating lid. Internal hydration sleeve (reservoir not included). Stretch-mesh side pockets, a large front stash pocket, and zippered hipbelt pockets offer lots of storage options. Sleeping bag compartment and removable sleeping pad straps. Rain cover located in the top lid of the pack to protect gear during wet weather. The lightweight mesh suspension system wraps around the torso and hips so well that it feels more like a sock on a foot than a back strapped to the back. Using an open-mesh, trampoline-style back pad and hipbelt, the Atmos 65 AG literally hugs the torso from shoulder blades to hips for the most comfortable hike possible. Since the Atmos fits the contour of the body so well, there is never any need to worry about the pack shifting unexpectedly and potentially throwing the hiker off balance while working a difficult section of trail. This is the beauty of Osprey’s patented Anti-Gravity Suspension system and one of many reasons why the Atmos 65 AG is an excellent addition to anyone’s backpacking gear. Anti-Gravity Suspension makes the pack fit the torso perfectly while greatly increasing the hiker’s range of motion. This system works by eliminating the foam padding and/or plastic framesheet found in the back panel of similarly sized packs. Instead, Osprey uses a non-stretch mesh that spans a steel perimeter wire frame. This allows the pack to wrap gently around the hips and all but eliminates the uncomfortable rubbing that can occur as a pack shifts while hiking with a load. This backpack is designed to carry loads of up to 50 pounds; although 40 pounds seems to be the sweet spot for this piece of equipment. The Atmos 65 AG has shoulder straps that are constructed of soft, open-mesh foam as is the hipbelt. The hipbelt is rigid enough that it will not fold over when in use and an integrated “Fit on the Fly” adjustment system allows for several inches of adjustment to the hipbelt while the backpack is strapped to the back. Specifically, the hipbelt can be adjusted by as much as six inches. The torso has four inches of adjustment as well to ensure a perfect fit every time the pack is strapped in place. One point worth noting is that the ability to adjust the hipbelt up to six inches means that there is the potential for a lot of extra straps that could become an annoyance to some hikers. Once a good fit has been established, some people may choose to cut the excess ends of the straps down to a more reasonable length (although this is a permanent solution that could backfire should the additional length ever be required). Features that most backpackers look for in a pack are found in the Atmos 65 AG including a removable two-pocket lid and sewn-in nylon cover that protects the contents of the pack when it is being used without the lid. The front of the pack has two large, deep pockets that provide quick and easy access to larger items such as a jacket or rain cover. Zippered pockets on the hipbelt are an excellent place to store small snacks, a GPS unit, or even a small point-and-shoot style camera. Other standard pack features include a zippered sleeping bag compartment located at the bottom of the bag and ice-axe attachments. Removing the top lid takes away about 6 liters of storage space in the pack but also cuts down on the overall weight and bulkiness of the loaded pack – perfect for difficult summit pushes where every pound counts. That said, some people have found that the lid is not particularly easy to put back on after removal so keep this in mind if you plan to remove and re-attach the top pouch frequently. The built-in hydration sleeve is difficult to use effectively. Many hikers have decided to simply place a CamelBak in one of the outside pouches instead as this is much easier to manage. Part of the reason why the built-in sleeve is ineffective has to do with the Anti-Gravity Suspension system. 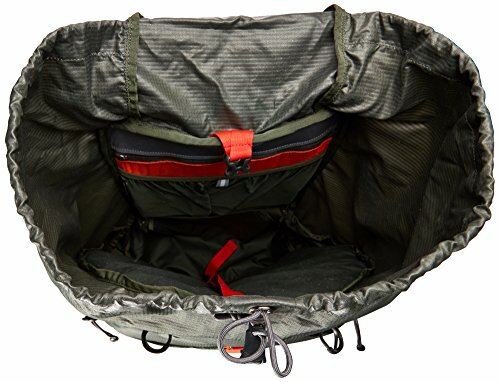 Since the back panel is made of mesh, it can be very difficult to get the bladder in and out of the bag (especially when loaded with gear). Despite these relatively minor drawbacks, the Osprey Atmos 65 AG is an excellent all-around piece of gear. Offering plenty of storage space for everything one needs for a multi-day excursion, the Atmos 65 AG feels like a much smaller pack even when fully loaded and strapped in place thanks to its generous use of mesh and the Anti-Gravity Suspension system. Many hikers report purchasing the pack and immediately taking it out for a multi-day trial hike. With most new gear, this isn’t advisable as an uncomfortable or ineffective piece of equipment will quickly ruin a hiking trip. The Atmos 65 AG, however, is so comfortable, durable, and versatile that hikers report absolutely loving the pack by the time they return from their adventures. If you are looking to replace an existing backpacking rig with something new or if you are looking to purchase your first internal frame backpack, the Osprey Atmos 65 AG is definitely worth checking out. Your shoulders, back, and hips will thank you after a couple days on the trail.